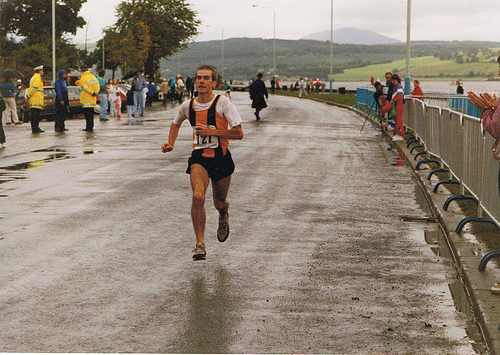 The very first mass participation marathon in Scotland was the Inverclyde Marathon – styled the ‘Inverclyde Folk Marathon’ – and it had a chequered career from its start in 1091 until the final running in 1998. At its peak it was one of the very best in the country but there was a three year shut down quite early on before it was resurrected. It was used as the SAAA and SWAAA official marathon championship, it included at times an international contest and had fields of over 1000 runners. Joe Small ran in the first one and he clearly still looks on it with affection: he has written the account of the career of the race which is reproduced below. The Inverclyde Folk Marathon was first held on Sunday, 30th August, 1981 when a field of over 500 set off from Greenock Esplanade to cover the 26.2 miles – there were 498 recorded finishers. 1981 was also the year of the first London Marathon and arguably, Inverclyde was the first Scottish mass participation race over the classic distance, the inaugural Glasgow People’s Marathon taking place in 1982. Such was the novelty of the race, it made front page headlines in the next day’s Glasgow Herald, complete with photographs. The course was essentially flat, staying close to the Clyde throughout. From the Esplanade start, the route headed west towards Inverkip before doubling back through Greenock and Port Glasgow, another ‘U’ turn, then heading back to the centre of Greenock and finishing, again on the Esplanade. The 1981 race, in which I competed, produced a win for the remarkable local runner Bill Stoddart (Greenock Wellpark Harriers). At the age of fifty he triumphed over a field of good class road racers, principally by running a very even paced race throughout. W Stoddart (Greenock Wellpark Harriers) 2:27:53; 2. E Cameron (Edinburgh Southern Harriers) 2:28:56; 3. C Spence (Spango Valley AC) 2:29:09; 4. D Geddes (Garscube Harriers) 2:29:18; 5. J Small (Clyde Valley AC) 2:30:08; 6. P McGregor (Victoria Park) 2:30:47. Teams: Victoria Park AAC 37 pts; 2. East Kilbride AAC 49 pts; 3. Kilbarchan AAC 56 pts. The second running of the race, on Sunday, 29th August, saw Tommy Wiseman (Victoria Park AAC) winning his first ever marathon. The winning time of 2:26:29 being a new course record. Wiseman won by a distance from last year’s winner, Bill Stoddart, with Stoddart’s team mate Tony Bird taking third place, a further 49 seconds behind. Victoria Park AAC won the team race. Leslie Watson (London Olympiads) repeated her victory of last year, improving her time to 2:51:38, over three minutes faster than in 1981, a performance which saw her placed fifty sixth overall in a field of over 600 runners. J Stephens (Dumbarton) 2:22:21; 2. J Duffy (Wellpark) 2:22:24; 3. G Fairley (Kilbarchan) 2:24:33; 4. D Fairweather (Law) 2:24:49; 5. B Carty 2:26:16; 6. R Blair (VPAAC) 2:26:18; 7. B Stoddart (Wellpark) 2:2:27:39. 26 year old John Stephens, a Royal Navy physiotherapist from Dumbarton AAC repeated his victory of 1983, beating more than 1100 rivals. His time of 2:23:13, slightly slower than the previous year, saw him defeat clubmate Allan Adams by more than two minutes, however runner-up Adams won the veterans prize. Third place was taken by David Fairweather (Law and District AC) in 2:26:57. The women’s race went to Rosemary Gillick (Stone Masters Marathon Club) in a time of 2:59:39. Second was Margaret Meredith (Red Rose AC) well back in 3:11:17. Dumbarton AAC won the team race with 14 points from Spango Valley on 25 points. 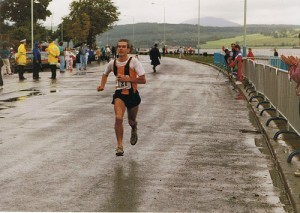 1983 runner-up John Duffy (Greenock Wellpark) won the 1985 race preventing John Stephens (Dumbarton AAC) attempt at a third successive victory. Duffy was timed at 2:23:44 with Stephens less than a minute back in 2:24:41. Last year’s second placed finisher Allan Adams (Dumbarton AAC) dropped one place to finish third his time of 2:26:10 saw him win the Scottish Veterans Championship, incorporated into the Inverclyde race. Mary Baker from Glasgow, competing in her third marathon, won the women’s race clocking 3:07:29 to win from Kate Dodson (Lanark) in 3:08:49. Dumbarton AAC won the team race with 32 points from Greenock Wellpark Harriers (32 points) and Greenock Glenpark Harriers (58 points). As a result, probably of falling numbers, the race was not held in the years 1986, 1987 or 1988. The first running of the race following the three year break, was covered by Doug Gillon in the ‘Herald’ as follows: “Three local athletic clubs have secured £10,000 from Greenock based computer firm IBM and have launched the Inverclyde Athletics Initiative. The sponsorship is being used to stage a Festival of Running on August 20th consisting of a fun run, a 10000m and the re-introduction of the Inverclyde Marathon. The 1981 race was Scotland’s first mass participation event but was last staged four years ago. Now, however, with the demise of several national marathons including the prestigious Glasgow event, IBM Spango Valley and the rival athletic clubs Glenpark and Wellpark, have got together to revive Inverclyde. IAI is chaired by former internationalist Bill Stoddart who, at the age of 50, won the inaugural event in 1981. The Initiative’s other targets include an all-weather track for which it is hoped the district council will shortly give approval. The marathon carries total prize money of £3000 with £500 to the first man and £300 to the first woman. The Scottish Women’s Cross-Country and Road Running Association have designated the marathon as their championship event.” The winners of the races, and the lucrative purses, were England’s Gareth Spring in 2:25:22, and Julie Harvey of Scotland in 3:06:23. Local athlete John Duffy proved victorious in the 1990 race, repeating his win of 1985 in a slightly slower time of 2:25:28. The women’s award went to Rosemary Kay of Scotland whose winning time was 2:54:15. T Mitchell (Fife AC) 2:24:50; 2. J Stephens (Low Fell AC) 2:27:10; 3. C MacDougall (Calderglen Harriers) 2:35:51. First Veteran: D Fairweather (Cambuslang Harriers) 2:38:14. Women: 1. E Masson (Kilbarchan AAC) 2:50:12; 2. J Harvey (City of Glasgow) 3:03:19; 3. M Blaikie (IBM Spango Valley) 3:07:39. Team Race: 1. Greenock Glenpark 69 pts; 2. IBM Spango Valley 90 points. J Duffy (Greenock Wellpark Harriers) 2:35:03 2. A Stewart (Ayr Seaforth AC) 2:39:35; 3. D Thomson (Unattached) 2:40:12. First Veteran: J McMorrow (Scottish Veteran Harriers Club) 2:48:35. Women: 1. E O’Brien 3:15:34. Fraser Clyne (Metro Aberdeen) 2:26:40; 2. R Lees (Clayton-le-Moors) 2:29:39; 3. D McAra (Falkirk Victoria) 2:32:09; 4. M Coyne (Leslie Deans RC) 2:32:46; 5. A Stirling (Bo’ness RR) 2:36:33; 6. G Cunliffe (Clayton-le-Moors) 2:40:47. Women: 1. E Robinson (Border Harriers) 2:55:42; 2. K Todd (JW Kilmarnock Harriers) 3:19:08; 3. M Thomas (Westerlands) 3:23:04. L Sho-Silva (Cambuslang) 2:42:20; 2. A Stirling (Bo’ness RR) 2:42:49; 3. C Hutt (Kirkcaldy) 2:43:32. Super veteran: D Fairweather (Cambuslang) 2:45:33. Women: 1. H Slimon (City of Glasgow: 3:06:23; 2. J Carr (Milburn Harriers) 3:44:38; 3. J Wilson (Perth RR) 3:51:22. F Clyne (Metro) 2;28:25; 2. J Duffy (Shettleston) 2:30:41; 3. B Scally (Shettleston) 2:31:37; 4. C Hutt (Unattached) 2:38:18; 5. D Fairweather (Cambuslang) 2:40:27; 6. J Bennett (Greenock Glenpark) 2:41:42. Women: 1. E Robinson (Border) 2:56:42; 2. C Lisle (FMC Carnegie) 3:27:17; 3. P Doanld (Deeside) 3:30:35. Again, the only details available are the race winners, with John Duffy completing a record fourth win. Men: J Duffy 2:38:44. Women: M Creber 3:05:14. B Scally (Shettleston) 2;29:32; 2. D Thomson (Portsmouth) 2:33:48; 3. T Mitchell (Fife) 2:39:06; 4. T Coyle (Unattached/Vet) 2:42:29. Women: P Affleck (Gala/Vet) 3:04:05; 2. F Florence (Shettleston/Vet) 3:11:29; 3. V Goldie (Milburn/Vet) 3:47:46. And that is Joe’s report on the last of the Inverclyde Marathons. It should have been recorded more prominently for its duration because it is clear that when it was properly sponsored, it was well enough organised to attrcat large fields, to attract quality fields and to host successful National Championships as well as international contests. The flat fast course was ideal for fast times, and the layout was great for the spectators who could see quite a lot of the race (not usual for marathons!) If anyone has any information to add about why there was a break of three years, we would like to hear it – although it was probably as Joe suggests due to ‘financial constraints’, as they say.